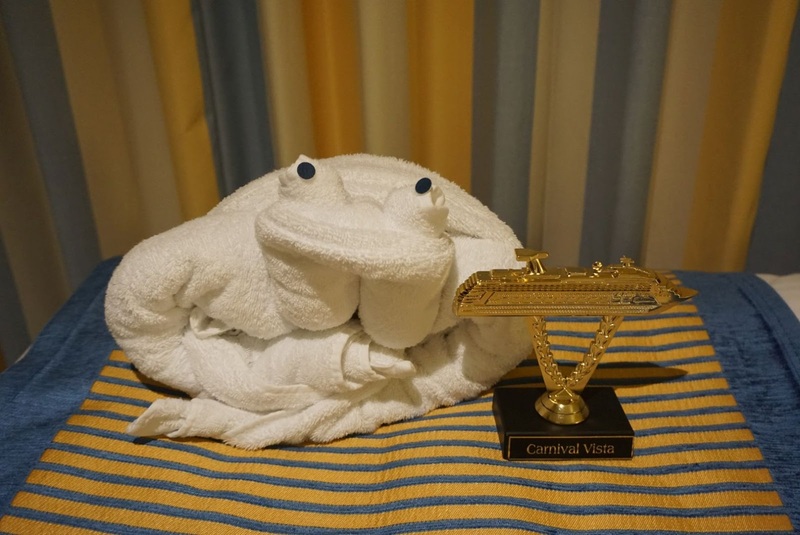 On our recent girls cruise, my best friend Keri and I stayed in a Balcony State Room on the brand new Carnival Vista. Today I want to show you why you want a Balcony Room when you cruise. We had a Balcony State Room and did a quick video tour of it which you can see below. This room felt a little larger than the other Balcony rooms we have stayed in. We had our king bed separated into two twins. I loved the nautical decor with the yellow and blue. It just had an updated look to it. There was also a full size flat screen TV in this room. It had local channels with live broadcasting. You could also rent a movie! This worked out perfect for me the one night I got sea sick. It happened to be Monday night, and I was able to watch The Bachelor from my room. I didn't plan that on purpose, I swear. 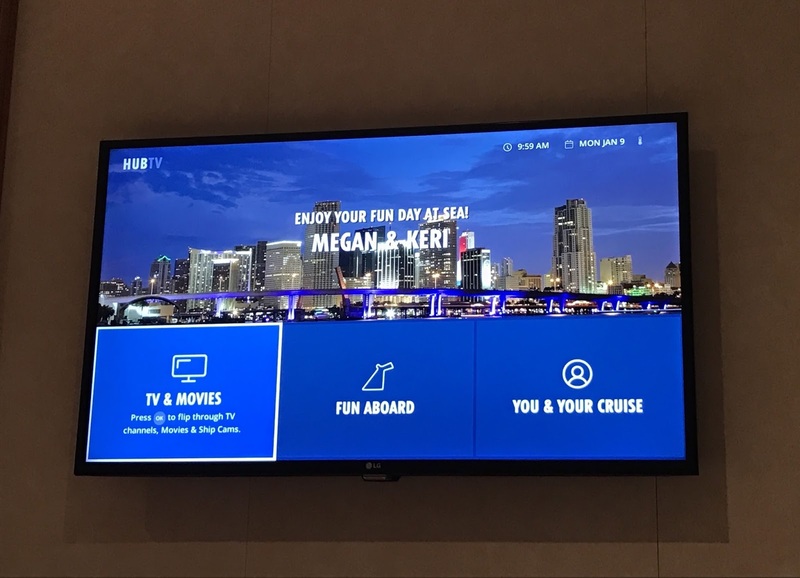 Another cool thing was that the TV also played part of Carnival Hub so the photos taken on board are linked to your room number and you could view them on the big screen. Another thing that made me very happy - there was a refrigerator in the room! This made me do a big happy dance. We didn't have to ask for buckets of ice for a nightly basis and we were able to properly store our two bottles of Chardonnay & Champagne we walked on with. It's also great for leftovers. We had a salad on one of the days at sea and the bowls fit perfectly in the fridge. The room also featured Elemis Spa products. I have always brought my own toiletries on cruises. Elemis is one of my favorite brands so this was a very nice surprise. The Balcony was similar to the other Balcony's we've had in the past. We love sitting out here nightly drinking a glass of wine, listening to music and talking about what our plans are. This Balcony was a little different though - we could people watch! Our room overlooked the outside patio of Red Frog Pub. 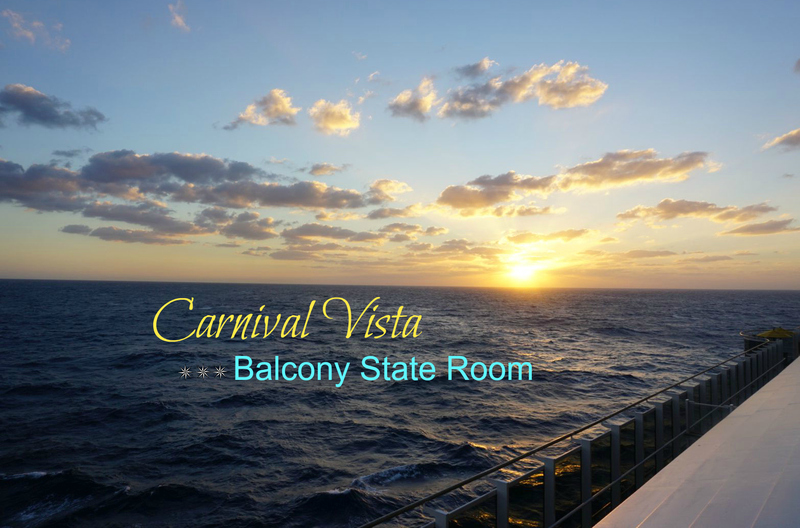 Overall, we were very impressed with the updates made to the Balcony State Room on the Carnival Vista. We had 6 nights and even with overpacking, we didn't make too much clutter. On that note, I will leave with with my new Ship on a Stick. Now that I have gotten two of these in a row, I foresee myself making a complete fool of myself moving forward to guarantee bringing one of these bad boys home. How did I win this coveted $1 trophy you ask? I got a hole in one during a putt putt competition. Talent!